How to Rip and Backup Blu-ray to NAS with 5.1 Surround Sound? NAS(Network-attached Storage is a type of dedicated file storage device for home media sharing. With the supported network protocols established between NAS and Blu-ray Player or HD TV, you can enjoy vivid movies in high definition. If you have dozens of Blu-ray collections, it's a wise choice to backup them to NAS devices for DLNA streaming. The question is how can you rip and backup Blu-ray to NAS with 5.1 Surround Sound? The following article will tell how to do and please keep on reading. To backup Blu-ray movies to NAS devices with 5.1 audio, you can use some third party Blu-ray ripping tool. Here're our testing results, the freeware Handbrake can not decrypt Blu-ray copy protection, and MakeMKV only rip Blu-ray to MKV format without compression, so the output files are commonly large in size and you'll losing original AC3/DTS 5.1 surround sound. The lucky thing is that Brorsoft Blu-ray Ripper (Windows /Mac) can rip/backup any (protected) Blu-ray to NAS and target device compatible MKV/MP4 formats while retaining original 5.1 surround sound. This Blu-ray Ripper is a powerful program which can easily help you rip and convert Blu-ray/DVD to almost all the popular video format like MKV, MP4, MOV, MPEG-4, WMV, etc as you want. Plus, it enables you to extract audio/music like TrueHD, DTS HD, etc from Blu-Ray disc without losing quality and keep its original and perfect 5.1, 7.1 channels. Insert your Blu-ray disc into your BD drive, and click load disc icon to load your Blu-ray movies. You can also import movies files from Blu-ray/DVD Video_TS folder, ISO. 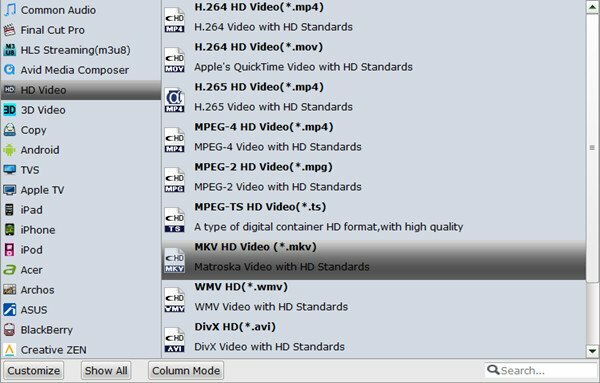 In order to preserve AC3, DTS 6 Channels audio in Blu-ray rips, I suggest you choose H.264 HD Video (*.mp4) or MKV HD Video (*.mkv) from HD Video in the drop-down menu of Format list. To keep original AC3 and DTS 5.1 surround sound in source of Blu-ray disc, click “Settings” to select audio codec (AC3), audio channels (5.1). With above settings, right click the red Convert button to rip Blu-ray to NAS in MKV/MP4 format with 5.1 audio tracks. Blu-ray copy protection will be removed automatically. Once the conversion is complete, you can right click the Open button to quickly locate the ripped files, then backup the converted Blu-ray movies to NAS devices for playback on the go.